Division Task Cards with Hands-On Manipulatives based on Common Core Division Standards. There are nine different task cards, ready for your kids to solve each division equation with the pictures/manipulatives to match. This is a great way to practice CCSS with your students!!! Each task card comes with hands-on manipulatives to be able to solve the division word problem. 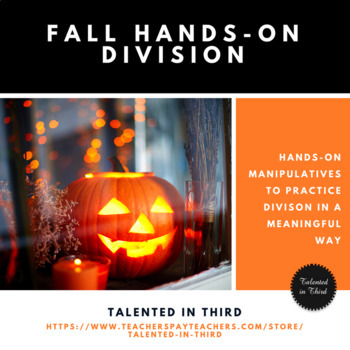 The task cards focus on division with a focus on an understanding of division in a deep way. This is a fun way to get students thinking critically about the skills they have learned and allows your students who still need hands-on manipulatives to count out the materials. In addition, it should help your students practice the connections to multiplication as they develop arrays and equal groups to solve the task cards. You can use these as assessments, in centers, as independent work, etc. Simply print the pages out and distribute to students as desired. If you have any questions, please feel free to ask. Check out my preview for a look at several of the task cards!